I've mentioned this project before on the blog, but now's the time to give it a full blog post. 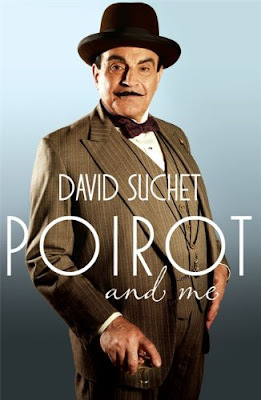 Back in October 2012 (just as production began on the final series), it was announced that Headline Publishing had acquired the rights in Poirot and Me, a book by written by David Suchet in collaboration with Geoffrey Wansell. It was to be published in autumn 2013. Now Amazon.co.uk have made the book available for pre-order. The book will be released November 7, 2013. Se also Headline's page on the release. Reportedly, this is Suchet's personal story of how he researched and 'became' the iconic character (over 320 pages). The book is said to contain lots of his personal photos from the sets over the years. This should be a very interesting read and a perfect companion to the series! This episode was based on the novel After the Funeral, first published in 1953. It was adapted for television by Philomena McDonagh and directed by Maurice Phillips. Philomena McDonagh's script for this film is truly exceptional. She remains faithful to Christie's story while also managing to include several embellishments that actually improve on the source material - and staying true to the spirit of Christie. Obviously, the distinctive post-war feel has had to go (i.e. because the series is set in 1930s), but only minor changes have had to be made to make that work. The rest of the changes are more important. First, McDonagh adds an opening sequence with Entwisthle and Poirot on the train. He describes the dramatis personae to Poirot, and this inter-cuts with flashbacks to the day of the funeral. This is an effective way of letting the viewers get an overview of this admittedly large ensemble of characters, rather like the family tree in Christie's novel. Second, George becomes Helen's son, and Susan Banks becomes Susannah Henderson. She is no longer married to borderline lunatic Gregory Banks but has instead become a missionary (rather like Lynn in Taken at the Flood). Third, Cora Lansquenet has become Cora Galaccio here, and her French (now Italian) ex-husband takes the role that was given to Alexander Guthrie in the novel, evaluating the paintings. Fourth, McDonagh adds a subplot / red herring in the shape of a missing will (bringing to mind the short story 'The Case of the Missing Will'). George was expected to inherit everything, but he forged a new will to disinherit himself. Fifth, Mr. Goby, Poirot's private investigator, is disposed of, and so is Poirot's rather unbelievable disguise as M. Pontalier. Instead, Poirot is introduced (as himself) much earlier, and he interviews all the family members. Sicth, Miss Gilchrist doesn't start working for Richard and Maude, but is persuaded by Poirot to stay at the house. Seventh, Entwisthle's sister is removed, and he falls in love with Helen Abernethie. Seventh, George and Susannah are revealed to be having an affair in the denouement scene. A somewhat strange addition, but it's done quite nicely in the film. Eight, Rosamund considered abortion but ends up visiting nuns because she feels ashamed. Ninth, the Vermeer painting becomes a Rembrandt (probably because Rembrandt is more well-known to modern audiences). Also, Timothy's ability to walk isn't revealed until the end of the film - he broke into Mr Entwisthle's office to get hold of the deeds to the house. All in all, however, the script is cleverly written, and it's a shame McDonagh never wrote any other Poirot scripts. Maurice Phillips's direction is a joy to watch. I particularly like the sweeping camera shots (see the funeral scenes), almost like a bird listening in to the conversations (c.f. the descriptions of Cora). The location used for Enderby is magnificent - Rotherfield Park in Hampshire. Other locations include the Bluebell Railway (Horsted Keynes Station and the Sharpthorne Tunnel), Putney Vale Cemetery and Crematorium, Normansfield Hospital Theatre, The New Wimbledon Theatre, Lincoln's Inn, London (Timothy's house and the convent). Stephen McKeon's soundtrack is suitably dark for the plot, and several tracks can be found on his website. Suchet continues to explore Poirot's loneliness ('the journey of life, it can be hard for those of us who travel alone, mademoiselle'). The guest actors do an excellent job portraying their characters, with well-known faces like Michael Fassbender and Geraldine James. But Monica Dolan is the star. What a performance! Breath-taking, completely chilling and emotional at the same time. Quite possibly the best guest act of the entire series. This episode was based on the novel Cards on the Table, first published in 1936. It was adapted for television by Nick Dear and directed by Sarah Harding. Apart from the above mentioned changes, however, Dear's adaptation stays fairly close to the source material (indeed, it's only in the final thirty minutes or so that things go off in... unexpected directions. All in all, however, I'm inclined to regard this as a perfectly acceptable adaptation, with some flashes of perfection (the bridge scenes, the dynamic between the four sleuths etc are all superbly done). Sarah Harding's direction is wonderful. I particularly like the opening scene at the gallery, inter-cutting with the photographic studio, which brilliantly set up two essential themes; crime as art and photography as (at least partial) motive for crime. Credit must also be given to the production design of this episode. Production designer Jeff Tessler and his team must have had so much fun. 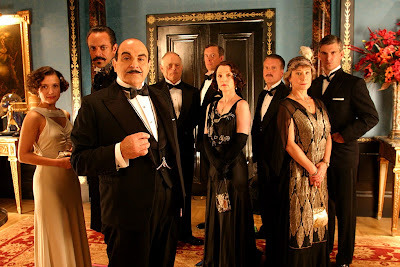 Not only are they given the opportunity to design and construct two long-running sets (Poirot's new flat and Mrs Oliver's flat - both strikingly similar to the descriptions in Christie's stories), but the rooms in Shaitana's flat are really exquisitely done, suitably exotic and sufficiently flamboyant. Locations include the 'Peacock House' / Debenham House in Holland Park (doubling as Shaitana's house - and also as Lord Edgware's residence in Lord Edgware Dies (2000)), Leighton House Museum (the interior functions as Shaitana's entrance hall), the Ham House Stables, Alexandra Court, 171-175 Queen's Gate, London (Mrs Oliver's apartment building - which would become the setting for Third Girl as well), Neal&Palmer, Piccadilly Arcade (where Poirot buys the stockings), and the Albert Memorial in London (see photos here). Stephen McKeon's score is particularly effective in this episode, with a suitably mysterious atmosphere to it. Parts of it can be found on his website, e.g. 'Cat and Mouse' and 'Shadows and Light'. Also, I can once again reccomend the 2006 behind-the-scenes documentary of Series Ten - if you can get hold of it. There's plenty of interviews with the cast and crew. I have to mention the introduction of Zoë Wanamaker as Mrs Ariadne Oliver. You can read my blog post on the character for a more in-depth look, but suffice to say that this was an inspired bit of casting. She might not be quite as battleship-like as the character from the novel, but to me, she's absolutely perfect as Ariadne, and her coupling with David Suchet's Poirot is absolutely perfect. Also, it's a joy to see Poirot have someone to play off, after an entire series 'on his own'. Of the other guest actors, Alexander Siddig perfectly captures the Shaitana of the novel, and the fantastic Lesley Manville is particularly moving as Mrs Lorrimer (and I'm quite impressed by her delivery of the scripted bridge lines in the interview with Poirot! That's almost as impressive as Benedict Cumberbatch's fast-speaking Sherlock). But of course, having only four (five) suspects and four sleuths, all the actors have time to excel in their parts - and most of them do. This episode was based on the novel The Mystery of the Blue Train, first published in 1928, which in turn was based on the short story 'The Plymouth Express', adapted for Series Three. The novel was adapted for television by Guy Andrews (who also adapted Taken at the Flood and Appointment with Death) and directed by Hettie Macdonald. Agatha Christie always considered this one of her lesser efforts. It's basically just an expansion of the short story, 'The Plymouth Express', and it consists of a wide range of incredible plot points. Therefore, it was no surprise that Guy Andrews felt the need to radically rewrite the story (although, like with his other adaptations, he adds some equally ludicrous points himself...). It's almost impossible to sum up all the changes, but I'll try to outline the most important ones. First, he makes everyone travel on the same train to Nice (cf. MOTOE), including the count, Lady Tamplin, Corky ("Chubby" in the novel), Lennox, Mirelle Milesi (just Mirelle in the novel) - as well as the ones from the novel (Ruth, Katherine, the maid etc.). Second, Poirot appears much earlier than in the novel, and he is well acquainted both with Katherine and Ruth before the train journey. In fact, he becomes Katherine's "avuncular" (with a particularly charming introductory scene at the hotel). Third, there is an elaborate birthday party for Ruth in London before the train journey, attended by everyone involved, and a party at Lady Tamplin's once they arrive in France. Fourth, Ruth asks Katherine to change compartments on the train, suggesting that Katherine might have been the intended victim. Fifth, there's an entire new back story to Katherine (her father killed himself after Van Aldin Oil bought his company and fired all his employees). Similarly, an entire back story is added to Ruth's mother, who is revealed to be in a convent / convalescent home in France, where she has become a nun. Sixth, Mirelle is Rufus Van Aldin's lover and not Derek Kettering's. Seventh, the extremely complicated background with "the Marquis", Demetrius and Zia Papopolous is removed (a wise decision). Instead, Corky finds the imitation ruby, Derek is in heavy gambling debt to the Count, and one of the culprits attempts to kill Katherine in her sleep. At the end of the film, the murderer commits suicide, instead of just being arrested by the French police as in the novel.The end result is such that, if you can get past the changes, the adaptation isn't half bad. 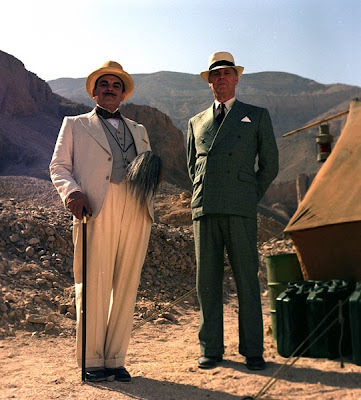 I particularly like the way in which Poirot's avuncular qualities are brought to the fore. I'm not going to defend the changes (what's up with Andrews and nuns? He adds them in all of his three adaptations! ), but I don't really mind him making them, both because the novel itself hardly can be considered plausible and because there was a need to distinguish it clearly from 'The Plymouth Express'. Hettie Macdonald's direction has divided opinions, I have noticed. Her experimental use of camera angles and shadows takes a bit of getting used to, I admit, but I find them mainly effective. Also, she benefits greatly from some really nice locations and excellent production design. The locations include (Sheraton) Park Lane Hotel, London, Menton Old Town, La Rotonde, Beaulieu-sur-Mer, Villa Maria Serena, Menton, Wansford Station and Nene Valley Railway, Musée des Beaux-Arts - Palais Carnolès (Nice railway station) and Freemason's Hall London (party scenes).Stephen McKeon, who composed the music for Series Ten and Eleven, does a nice job with this particular episode. See his website here. Also, if you can find the 45 minutes behind-the-scenes documentary on Series Ten, there is plenty of more information on this production there, including a short interview with scriptwriter Guy Andrews. Again, Suchet adds little touches of Poirot's sense of loneliness (see, for instance, the end scene). It's lovely to see the character develop from the early years to his retirement. Of the guest actors, most suit their roles, but Lindsay Duncan and Georgina Rylance are the standouts in my opinion. This episode was based on the novel The Hollow, first published in 1946. It was adapted for television by Nick Dear and directed by Simon Langton. Nick Dear does an excellent job with the adaptation of this particular novel. 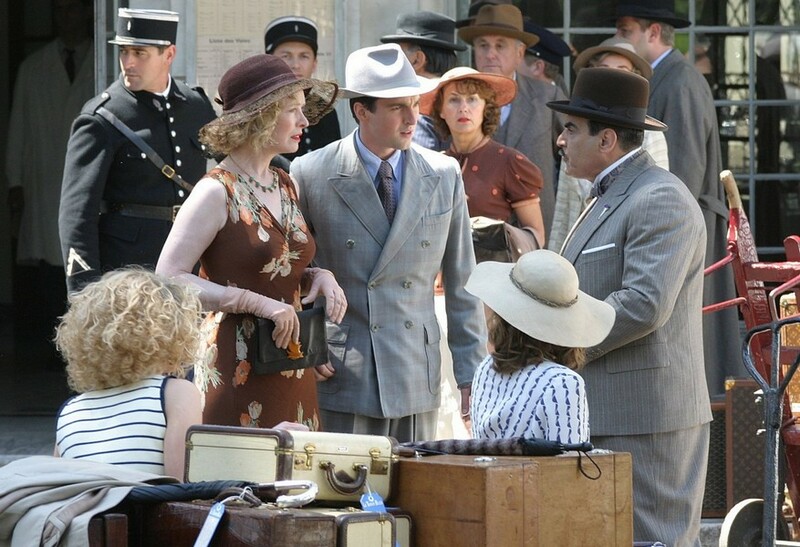 The script has the perfect balance between melancholy, humour, seriousness and Poirot-ness. Dear deletes the character of David Angkatell (and he's not missed). He adds an opening scene with Henrietta Savernake and John Christow (which makes perfect sense) and some arrival scenes for Poirot (delightful). 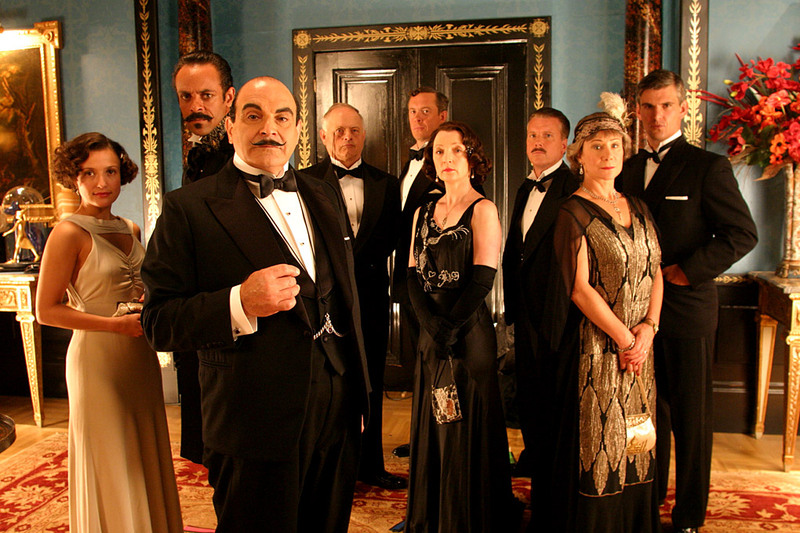 Also, Poirot gets invited to dinner the evening before the lunch, a small change which, again, makes sense, and the murder weapon isn't discovered outside his cottage (thankfully - that never made sense to me). Moreover, Poirot gets the horse clue right not because it's like the Horse of Troy, but because the person in question explains that she hates horses (a much more satisfying reason, if you ask me, and very much in keeping with Poirot's sense of psychology). Dear also removes Edward's attempted suicide, compresses the scenes with Edward and Midge in London (but they are referred to in the dialogue), removes Henrietta's visit to Mrs Crabtree, and changes Gerda's death (SPOILER she goes to John's study and takes potassium cyanide). All in all, though, the adaptation is remarkably faithful and beautifully written, possibly one of the best episodes of the entire series. I'm always delighted when Christie's stories are taken seriously. Langton's direction is a joy to watch, especially the opening sequence and the autumnal feel to every shot. I particularly like the staged shots of the pool, perfectly recreating the sense of artificiality / theatricality Poirot comments on in the novel. The locations used for the episode are perfect, too. Duchess Street in London was used for Christow's Harley Street home. The soundtrack is wonderful, Gunning outdoes himself. The beautiful main theme of the episode is available on his album The Film and Television Music of Christopher Gunning. Suchet's Poirot is excellent in this one. I always enjoy the cases in which Poirot's interest in psychology comes to the fore, and this is certainly one of the best on that account. Also, we have his dislike of the countryside, his breakfast (the little blobs of jam on the toast) and his sense of justice, truth, right and wrong (as displayed in the well-scripted conversation with Henrietta). The guest actors work wonderfully together as an ensemble, so it's almost impossible to pick a favourite, especially with veterans like Sarah Miles, Edward Fox and Edward Hardwicke on the cast list. The third episode of Series Nine was based on the novel Death on the Nile, first published in 1937. It was adapted for television by Kevin Elyot and directed by Andy Wilson. Kevin Elyot does a good job adapting one of Christie's most famous novels. It's a hard task to take on, because viewers will always have their own ideas of how certain things should be included and done. (And that's probably why the reactions have been stronger to episodes like The Murder of Roger Ackroyd, Death on the Nile and Murder on the Orient Express - people know them so well that it's almost impossible to please every viewer). In my opinion, however, Elyot succeeds in his attempt, even though he makes a series of changes. First, several minor characters are removed, including Jim Fanthorp, Mr. Fleetwood, Signor Richetti and Nurse Bowen. The first three could hardly be considered significant losses, since they provide next to nothing to the proceedings. Nurse Bowen is a slightly more important character, but she doesn't feel missed, since her main role is assigned to Cornelia Robson instead. Second, Elyot does away with most of the pre-Egypt scenes, including Poirot's, Jaqueline's and Simon's visit to Chez Ma Tantz restaurant, the Allertons at Majorca, Van Schuyler and Cornelia in New York, the lawyers in the UK and the US and the Otterbourne's visit to Jerusalem. These scenes are hardly missed, as they do little more than set up the characters anyway. An added party sequence at the hotel in Egypt does that job quite as well. Third, Colonel Race doesn't join the cruise because he is onto one of the passengers, but because he wants to join his friend Poirot. This is a minor change, as it only does away with a 'red herring'. Fourth, Elyot adds a few lines between Jacqueline and Poirot on the boat, taken from Dead Man's Folly (It is terrible, mademoiselle, all that I have missed in life). Fifth, and most importantly, perhaps, Timothy and Rosalie's relationship has a different resolution. In fact, it is implied that Timothy is either gay or too attached to his mother (the second option is somewhat implied in the novel). All in all, however, Elyot manages to maintain much of Christie's original dialogue, humour, wit and plot, making the adaptation a largely successful one. Andy Wilson makes excellent use of the Egyptian locations, with some beautiful shots of the ship and the archaeological sites. The opening sequence, however, is somewhat peculiar, with a shot closing in on a rooftop window (reminiscent of the Harry Potter films). But I love the entrance of Colonel Race, very much in the style of Lawrence of Arabia / Omar Sharif. The feel of that scene would be repeated for Appointment with Death and Dame Celia Westholme, too. The production design is impressive, with particular attention given to the ship. The locations used include the SS Sudan (used as the Karnak), Eltham Palace (Linnet's house), The Sofitel Winter Palace Hotel, Luxor, The Cairo Marriot Hotel (interior), the Valley of the Monkeys and Dendera Temple. Gunning's soundtrack for this episode is absolutely perfect (with a minor slip in the Hitchcock reference...). The entire score is available on the latest Poirot CD, 'Death on the Nile'. Suchet's Poirot is as good as ever, and again, there are some hints of his deepening of the portrayal, with the introduction of loneliness. See the Poirot and Me documentary for more on that aspect. Of the guest actors, there are so many standouts it's almost impossible to name them all. I'll settle down on Frances de la Tour and James Fox, both perfect for their roles.